(Bloomberg) -- Australia’s central bank is holding fire on interest rates, even as a slide in the nation’s home prices deepens, as it awaits a resolution to the divergence between strong hiring and decelerating economic growth. 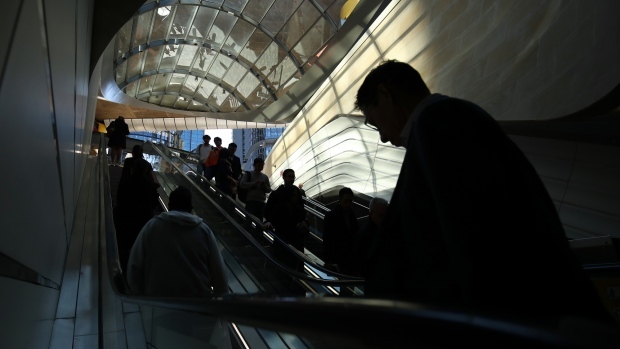 The Reserve Bank said the labor market is “particularly important” to the outlook and reiterated there’s considerable uncertainty over consumption, minutes of its March 5 policy meeting released in Sydney Tuesday showed. It said dwelling investment was expected to subtract from growth and the decline “could be sharper” than currently expected. The RBA has shifted to a neutral policy stance as tumbling property prices weigh on household spending and damp growth. The weighted average of home prices across the nation’s eight capital cities fell 2.4 percent in the final three months of 2018 from the preceding quarter, equating to a 5.1 percent decline from a year earlier. The central bank is trying to reconcile the economy’s slowdown with strong job gains and falling unemployment, as well as liaison with firms that signal a healthy employment outlook. The RBA noted this discrepancy is visible in several other developed economies. The Australian dollar traded at 71 U.S. cents at 11:54 a.m. in Sydney, little changed from before the minutes and home price data were released. The board met a day before the release of GDP data showing the economy decelerated in the second half of the year to an annualized 1 percent from almost 4 percent in the first half. The RBA has kept rates on hold for 2-1/2 years as it aims to boost employment, lift wages and reignite inflation. While the RBA said a trough in mining investment is near and spending is set to resume, Western Australia, the epicenter of the commodities boom, is struggling. State unemployment has climbed to around 6.5 percent there vs 5 percent nationally, and wage-growth is 1.6 percent vs 2.3 percent for the country. Policy makers noted the global economy had cooled in the second half of 2018 and this had continued into 2019. However, they were unable to read too much further into the picture as the U.S. government shutdown and Chinese New Year holiday had impacted the timing of data releases. On the U.S.-China trade war, the RBA said there had been “spillover effects” on some other economies: a decline in Chinese imports to meet domestic demand and facilitate export production in east Asia; an easing in intra-regional export growth; and survey measures of new exports orders in east Asia had “declined sharply” to be below average early in 2019.